Marinated Cherry Tomato Salad is very delicious way to use an overabundance of cherry tomatoes. This menu is vegetarian recipes and it’s easy for cooking and delicious. And then use in period Kin Jay festival. That is good idea for Vegan. 1. In a small bowl or cup measure, mix together oil, apple cider vinegar, herbs, salt, and sugar. 2. 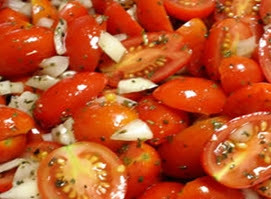 Pour dressing over cherry tomatoes in a serving dish, and gently stir to coat. Chill for at least 2 hours. Gently stir from bottom to top, coating all tomatoes, before serving.